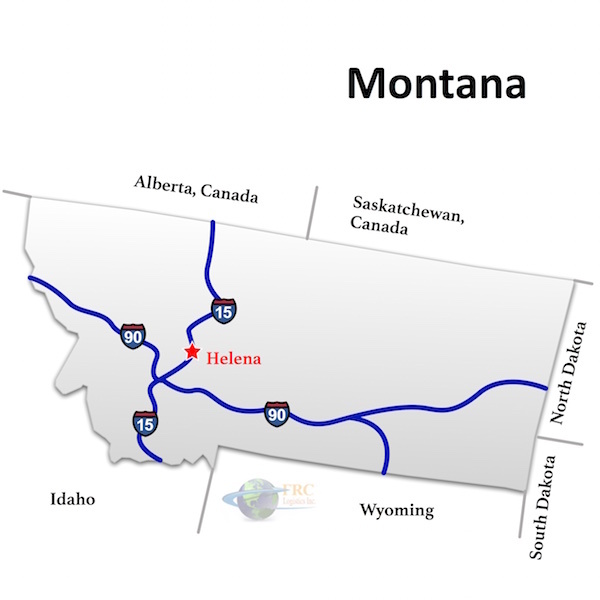 Montana to Florida shipping and trucking services are in high demand; Helena to Miami is a very heavily traveled route for freight transportation. The Helena, MT to Miami, FL shipping lane is a 2,718 mile haul that takes more than 40 hours of driving to complete. Shipping from Montana to Florida ranges from a minimum of 1,907 miles and 29 hours from Billings, MT to Pensacola, FL, to over 2,952 miles and a minimum of 44 hours on the road from Trego, MT to Fort Lauderdale, FL. The shortest route from Montana to Florida is along the I-90 E; however, there is a more southerly route that also uses the I-75 S traveling through Springfield, MO and Birmingham, AL. Named after the Spanish for “mountainous country,” Montana contains numerous mountain ranges, many of which form part of the Rocky Mountains in the west of the state. Its unofficial nickname, Big Sky Country, refers to the huge expanses of flat open plains in the eastern part of Montana, which provide fertile ground for agriculture and ranching and cover 60% of the state’s territory. The major cities of Montana include Missoula to the east, Billings in the south and Great Falls. State capital Helena, Butte and Bozeman are also major population centers. Thanks to its size, geography and the Continental Divide, the weather in Montana can vary dramatically. The coldest temperature ever recorded in the US was in Montana (-70ºF) and the valleys and mountains can attract fog that is difficult for even experienced Montana trucking companies to navigate. Florida is a state that has an incredibly long coastline with many islands and peninsulas. Most of the state has a sub-tropical climate, with temperatures that often top 100° F in the summer. Most major shipping and trucking delays in Florida are related to hurricanes and tropical storms, which regularly affect various part of the state, especially on the east coast. Look out for hurricanes and tropical storms from June through November. Florida’s largest cities, all with populations of over a million in their metropolitan areas, are Miami, Tampa, Orlando and Jacksonville. However, Florida has many medium-sized cities and industrial areas along its coasts; shipping tends to be distributed over a large area in Florida. Montana to Florida Freight shipping quotes and trucking rates vary at times due to the individual states industry needs. Since Montana and Florida are mainly agricultural, we see plenty of shipments by refrigerated trailer, flatbed as well as by the more common dry van trucks. Heavy Haul Trucking services are also common from Montana to Florida. Our Less Than Truckload (LTL) carriers are also running a number of regular services between the two states, and it’s an active route for heavy haul freight shipments, as well.